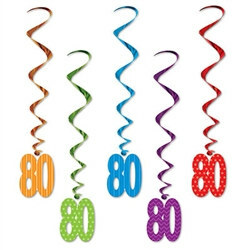 WOW, you made it to 80! Use these colorful 80 Whirls to decorate for your monumental birthday! Each package contains 5 whirls, one of each color; orange, green, blue, purple and red. A string is attached to one end for easy hanging from ceilings, walls and tables. We also carry tableware in these colors to coordinate for your party. This product was even better than photo. Very pleased.